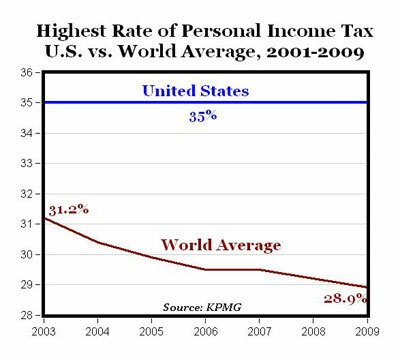 The chart above is based on global personal income tax data (highest marginal rate) just released in KPMG’ study “Individual Income Tax and Social Security Rate Survey 2009.” The trend globally over the last six years is towards reductions in the highest personal income tax rates, which have fallen from 31.2% in 2003 (average of 86 countries) to 28.9% in 2009. The highest marginal tax rate in the U.S. has been 35% since 2003. The Obama administration plans to let the U.S. rate jump to 39.6% in 2011, which would be almost 11 points higher than the international average. Worse still, the United States has state income taxes with rates up to 10% that are piled on top of the federal tax. Some of the nations in the survey (e.g. Canada) also have subnational income taxes, but many, or most, of them do not.